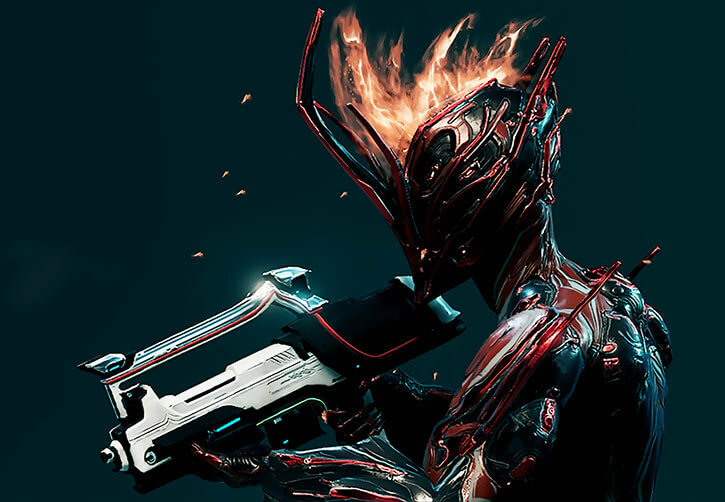 If you’re not familiar with the Warframe video game, you can first check our Warframe setting article. This entry assumes familiarity. Part #2 – Warframes in general (with separate individual profiles). Part #3 – Archwings, Sentinels, etc.. It only covers weapons I’ve used. It focuses on the most notable ones. The article thus starts with a small-ish selection, and will evolve as I try new weapons. The Player Characters have superhuman strength and acumen. An arrow from a bow shot by a warframe is much heavier than a normal one and flies at extreme speeds. It outperforms a low-tech ballista by a large margin. During the Old War, lower-tech weapons became the norm. That was to prevent the Sentients from taking remote control of them. A loss of technological know-how during the Old War and the Fall of the Orokin. Low-tech firearms having been greatly refined during the Old War, out of necessity. 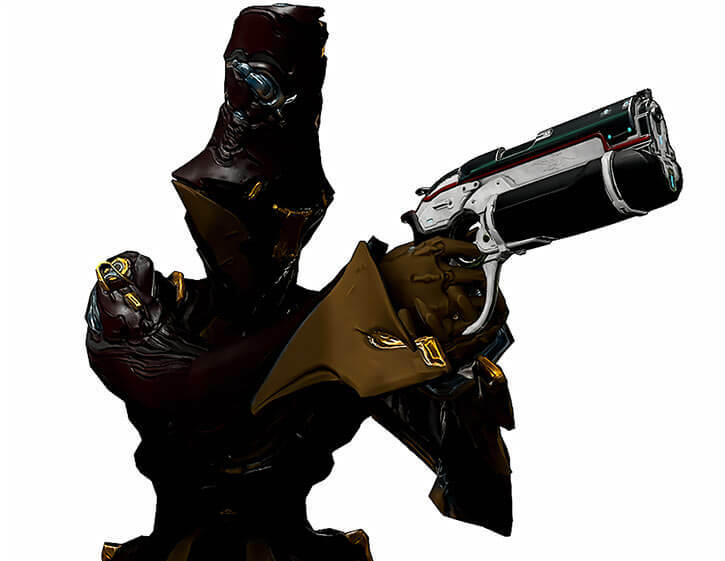 Many firearms, particularly Grineer ones, feature reservoirs of liquid. It seems likely that they use liquid explosives rather than gunpowder as propellant. This might reference the old idea of using binary propellants (two liquids that explode when mixed, but are stable separately) to fire faster and heavier projectiles. Establishing a fact-based scale for the ordnance in Warframe ain’t gonna work. Each weapon goes through 30 levels as it gains experience. This performance is multiplied by mods applied to the weapons, with many variables (rarity, available drain, synergies…) playing a strong role. There isn’t quite a “normal” target that could serve as a baseline. Opponents also come in a wide variety of levels. The more “normal” target in the game is the feral kubrow, an Earth animal. But it’s heavily genetically engineered. So we can’t assume it is as durable as another animal of a comparable mass. It’s almost certainly tougher than that. The stock low-level opponent is a Grineer lancer – basically a space marine. I am going to arbitrarily assume a BODY of 07 for these. It’s lower than the stock space marine type, but these are disposable clones intended as cannon fodder. This suggests a scale where weapons have two more APs of EV, and two APs of Sharpness (EV) over comparable modern firearms. Warframes are superhumanly strong. They are also larger than the vast majority of humans, and much heavier. Likewise, a lot of enemy units such as Corpus crewmen and Grineer marines seem to be huge and with augmented strength. It thus seems reasonable to assume that the weapons are markedly larger, heavier and with a beefier recoil than modern weapons for humans. This is reflected here with Recommended STR values. This mechanic is explained in the Gadgetry article. Standard DC Heroes rules have the APs of Ranged Powers (say, Projectile Weapons) also indicating their Range. This generally works well with modern weaponry, but starts producing odd results as APs get higher. This is the case with many Warframe weapons. These have enough APs to make improbably long-ranged shots. We’re not generally going to bother correcting for this, since it is a system-wide characteristic. The one exception is the Shotgun Blast Power, which was developed to avoid writing the same modifiers over and over again (including Range-related ones). Our Rules Miscellanea page has optional rules for handling Range in more realistic Genres. These could be used if the effect of high APs on Range bother you. Here are some basic weapons. There isn’t much to say about these, but they show concrete examples of these additional APs getting applied. 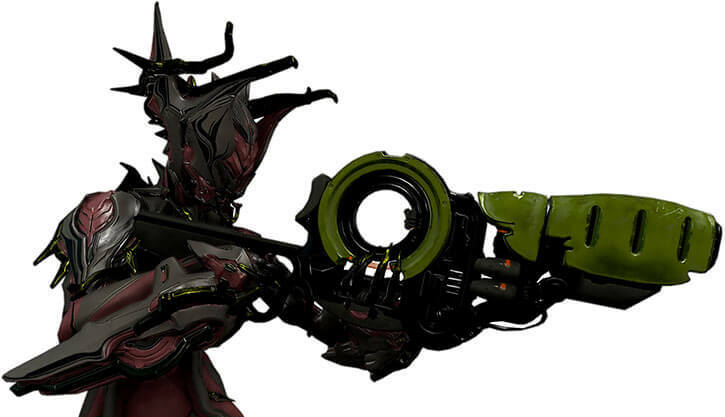 A typical Tenno-made automatic weapon. [BODY 05, Projectile weapons: 08, Sharpness (Projectile weapons): 02, Ammo: 12, Recommended STR 04, Advantage : Autofire, Descriptor: Ballistic]. Standard tenno shotgun. The super-dense pellets are good against shields. [BODY 05, Shotgun Blast (Range 03): 08, Sharpness (Shotgun blast): 02, Ammo: 06, Recommended STR 06, Drawback: Very Long Reload, Descriptor: Blunt]. Standard Tenno sabre. It has been suggested it is derived from traditional Russian designs. [BODY 09, Enhance (EV): 02 (cap is 10), Sharpness (EV): 02, Recommended STR 04, Descriptor: Slashing, piercing]. 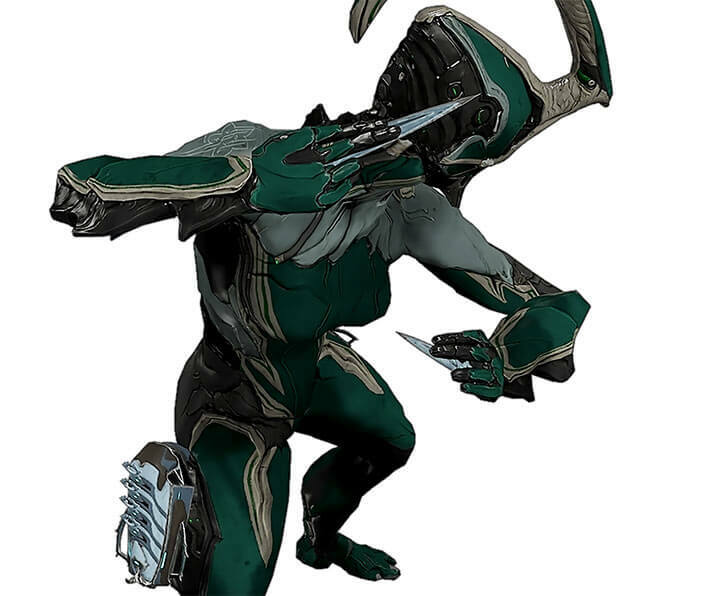 Titania warframe dual-wielding skanas that emit a corrosive field. Standard Tenno sidearm in a medium calibre. [BODY 04, Projectile weapon: 06, Sharpness (Projectile weapon): 01, Ammo: 15, Recommended STR 04, Descriptor: Ballistic]. A surprisingly subdued, workhorse Grineer submachinegun. The recoil and report are moderate, and the slow-ish fire rate allows for accurate-by-Grineer-standards automatic fire with the heavy handgun round. The 57-round mag also gives excellent staying power. And the magazine well and ejector systems allow for lightning-quick reloads. Since it’s used by huge and super-strong gunners, this SMG is wielded more like a machine pistol. [BODY 04, Projectile weapon: 07, Sharpness (Projectile weapon): 02, Ammo: 13, Recommended STR 05, Descriptor: Ballistic]. These threatening-looking power gauntlets augment the force of blows. They can also release a concussive blast when hitting hard ground, staggering nearby opponents. [BODY 07, Enhance (EV): 01 (cap is 10), Shockwave (0 APs radius): 08, Descriptor: Blunt, Recommended STR 05, Note: Cannot Be Taken Away]. This is a glaive in the sense of the 1980s movie Krull. That is, a large bladed weapon that can be throw as a spinning disc of death, and follow odd trajectories. These do pop up in video games from time to time – say, Torchlight. The Tenno glaive is spring-loaded to deploy its blades. Since it is so large and heavy, it can be wielded in melee like a sort of strange sword, using specific styles. When thrown with superhuman strength it will ricochet off targets and obstacles, quite possibly harming several. On its last bounce, the glaive will fly back to the thrower. This and its odd aerodynamics are likely done using anti-gravity tech. Presumably the same sort used on warframes. These ricochets are hard to predict in open spaces. So it can’t really do precision caroming like Captain America’s shield or Daredevil’s billy club. But in more enclosed spaces, precision doesn’t matter. Since it doesn’t use any propellant, a glaive doesn’t register on sensors, doesn’t make an easily identifiable sound, won’t be picked by ballistic radars, etc.. It is thus an asset in maintaining stealth. [BODY 06, Enhance (EV): 01 (cap is 08), Range: 03, Recommended STR 06, Descriptor: Slashing, Note: not meeting the Recommended STR also lowers Range, which corresponds to the weapon being thrown]. In most conditions, the glaive will only hit another desired target if the throw attack rolls a double. In more confined conditions, where the glaive doesn’t really have somewhere else to go, a glaive can hit up to four targets. Say, four enemies running in a narrow corridor or occupying a small room. This huge weapon has peculiar striking surfaces, seemingly made of solid light. As weapons go, it isn’t a good design. It is hefty and too front-heavy, making it slow and clumsy even when wielded by a trained warframe. 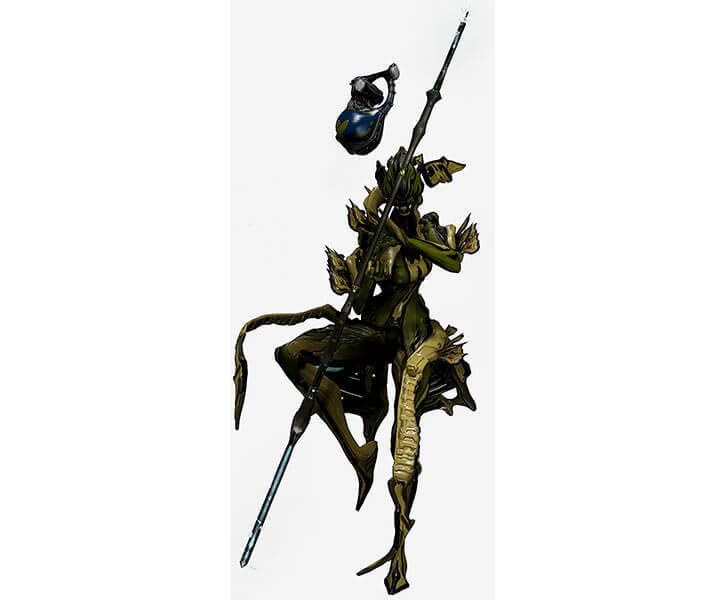 It is thus commonly modified to increase its speed and responsiveness, likely using the same tech warframes use for mobility. Our stats assume such modifications. Designed by an artificial intelligence, the Heliocor doubles as a scientific research weapon. The impact of the hard light head also emits scanner rays. These benefit from the damage inflicted to the target, to scan its inner workings. Killing stuff with an Heliocor thus generates ample if indiscriminate data about their physiology. Or electronics, for robots. [BODY 08, Data storage: 18, Enhance (EV): 02 (cap is 12), Sharpness (EV): 02, Descriptor: Bludgeon, Recommended STR 07]. The Data Storage stores information about the targets, particularly exposed workings/tissues resulting of Helicor blows. 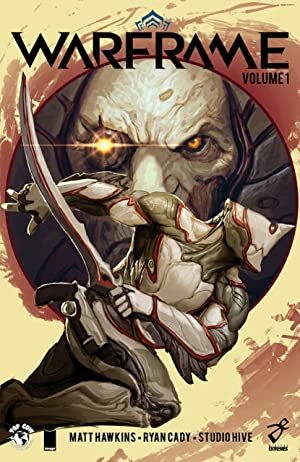 The Warframe setting doesn’t use Scientist (Observation), since it’s such a Silver Age comic books skills. But the data facilitates more realistic, much slower Scientist rolls to determine to which forms of attacks/energies the target type is particularly resilient or vulnerable toward. It also allows for less martially-inclined scientific inquiry. Say, for simple xenozoological purposes. Without in-game speed-enhancing mods (such as Fury), the Recommended STR would be 9. The blows are just too slow. These are four claws from Infestation creatures that have been set upon a set of back-of-the-hands protections, and the equivalent of a steel-toe protections. The specialised armour plates allow a warframe to kick and punch at full power. The alien claws atop the plates have a vampiric effect. Which creature this is derived from is unclear, but it may come from “disruptor” creatures that drain energy. In the case of the hirudo, the drain is used to repair the warframe and keep it going. Perhaps it is some form of skin-tight forcefield under the normal shields, not unlike a Rhino warframe. The claws are also extremely hard. They can easily penetrated metallic body armour. Wielded by a warframe accomplished in the martial arts, such as Valkyr, this is devastating. 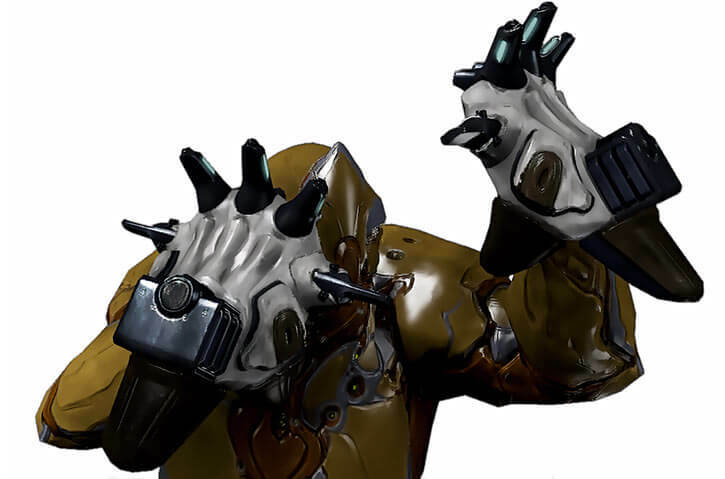 Valkyr Prime warframe with Hirudo claws mounted on the back of her hands. Photobombing courtesy of Muffin the vain kavat. These enormous blades are “tonfa” in that they have a similar side handle construction. But they otherwise are their own thing. Such weapons only make sense for super-strong and super-durable, tireless wielders. 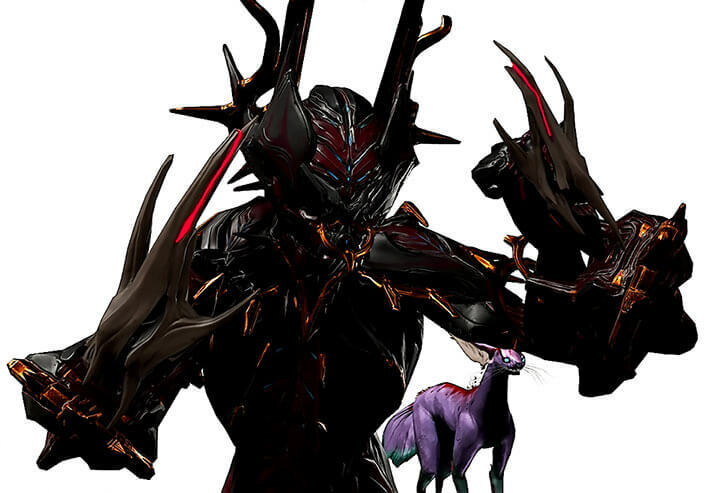 Many of the advanced moves also use the weight and gravity manipulation of warframes to produce a whirlwind of powerful stabs and massive slashes. [BODY 09, Enhance (EV): 02 (cap is 11), Sharpness (EV): 02, Descriptor: Slashing, Piercing, Recommended STR 07]. Very much like the Kronen, but with even more… distinctive aesthetics. Rather than an edge, it has various spikes and claws. [BODY 10, Enhance (EV): 02 (cap is 11), Sharpness (EV): 02, Descriptor: Piercing, Recommended STR 07]. One of the most classic and beloved Warframe melee weapons. It is an axe head on a pole, with a smaller blade on the other end. However, it is in practice wielded more like a quarterstaff, with the techniques emphasising rapid, sweeping, arcing strikes. This style likely wouldn’t work without abnormal levels of speed and strength on the wielder’s part. The big asset of an orthos is its reach. Said sweeping arcs will cleave through numerous opponents around the warframe, as the fighter spins and twirls. This asset is usually further emphasised with range-enhancing mods. One can imagine that the axeheads are outfitted with force emitters, creating a giant transparent force blade around the physical one. Perhaps square, spade-like ones. With such modifications, hitting opponents half-a-dozen metres away with one sweep would be common. Which means that being mobbed by, say, Infested creatures isn’t an issue unless they’re highly durable. This here is the “prime” version of the Orthos. 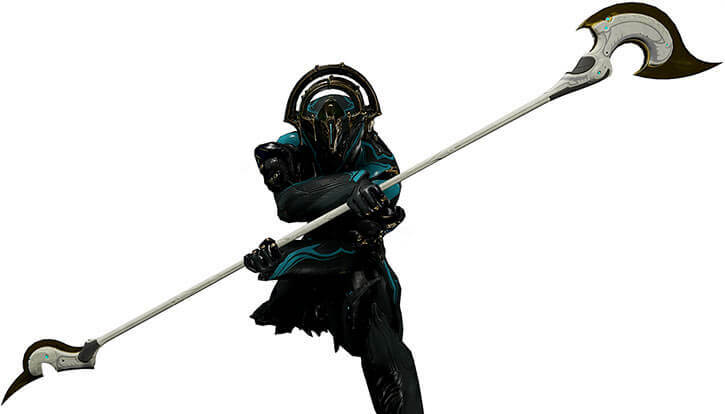 It thus sports the Orokin decadent aesthetics with the marble whites, shiny golds, arches everywhere, the equivalent of RGB lighting, etc..
A staff with a broad, bladed head. In the hands of a specially trained, superhumanly strong and fast wielder, the tipedo moves with blinding speed. An expert warframe can thus slash one or multiple enemies, laying waste around them. One could imagine that this is done using a somewhat flexible haft, allowing the weapon to store and restitute momentum when swung right. Some Zulu weapons, among others, used this principle. [BODY 06, Enhance (EV): 01 (cap is 11), Sharpness (EV): 02, Descriptor: Slashing, Recommended STR 06]. An expert will have the Fists of Fury Schtick, possibly limited to the tipedo. In DCH logic, this is a property of the wielder, not the weapon. 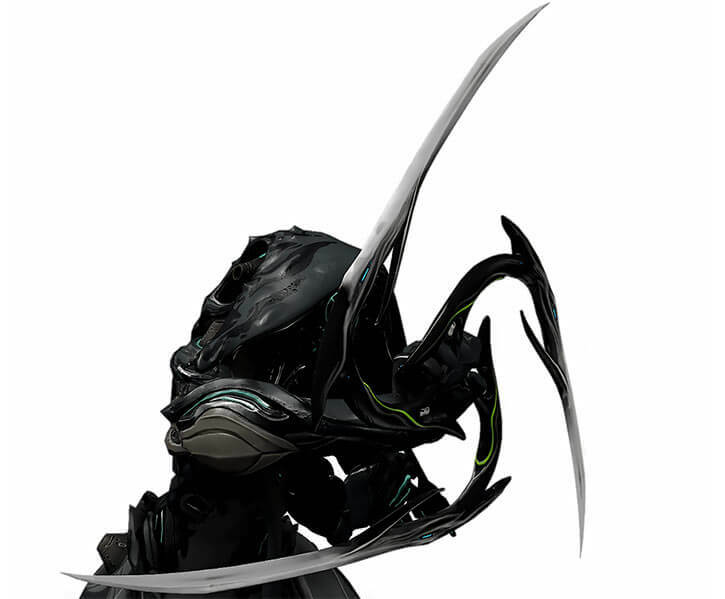 This odd design is associated with Gara warframes. These can generate and manipulate a strong, sharp glass-like substance. The elaborate, crystalline head of a Volnus is typical Gara aesthetics. Oddly enough, this weapon is properly wielded as if it were an ancient fighting hammer, rather than as axe. This may be because the head’s material gives it a counter-intuitive balance. But once one is used to that, the Volnus is remarkably fast and agile. [BODY 10, Enhance (EV): 02 (cap is 12), Sharpness (EV): 02, Descriptor: Slashing, Recommended STR 07]. This rare weapon can only be produced in some Corpus and Tenno armament labs. It is a cannon that shoots a big bubble of high-energy plasma. This projectile will smash, fry and irradiate everything it touches before it loses its coherence after about 30 metres. Though the damage is enormous, it is possible to defend against it. It is simply that armouring against plasma and radiation isn’t standard. The main exception are the Infested, which have tremendous radiation tolerance. [BODY 02, Energy blast (Area of Effect 1): 10, Sharpness (Energy blast): 02, Ammo: 10, Descriptor: Radiation, Recommended STR 06, Drawback: Slow Reload Speed]. The RV vs. this radiation descriptor is boosted by Systemic Antidote, but not Sealed Systems. The Area of Effect is actually a line 0 APs wide and 3 APs long. The Boar is an automatic shotgun. As such it shotguns, automatically. The pellets have a lower amount of propellant than those for its cousin, the Strun. 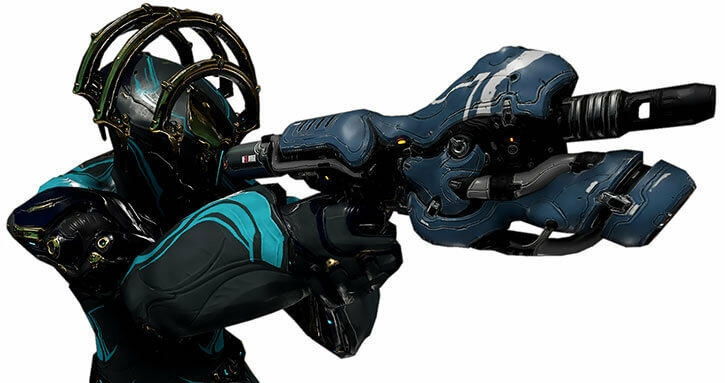 This keeps the weapon controllable, though the recoil remains bad even for a strong warframe. The Boar is thus used as a “room broom” or “street sweeper”, to deliver high volumes of close-range fire. It shreds the softer targets, and provides copious suppression fire. Still, it is a niche weapon. Unless you *know* that the deployment is 100% CQB against light infantry, a Boar operator is best paired with another warframe with more general-purpose weaponry. [BODY 04, Projectile weapons: 10 (Diminishing, Area of effect 1 AP), Sharpness (Projectile weapons): 01, Range: 03, Ammo: 05, R#03, Recommended STR: 06, Limitation: Projectile weapons has No Range, use the listed Range]. 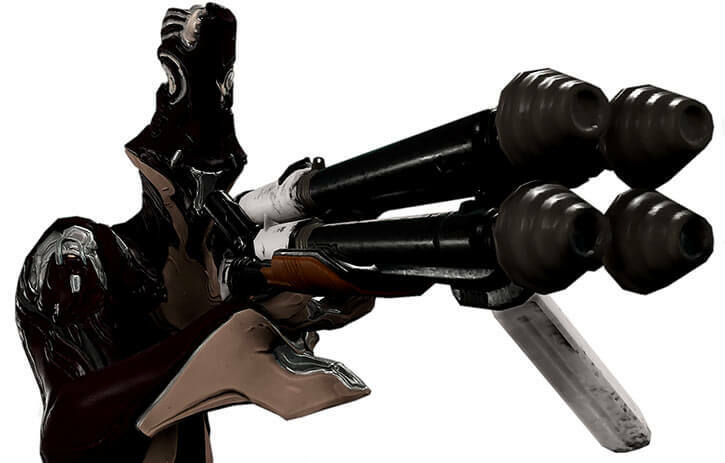 This Tenno weapon’s H.R. Giger aesthetics are its more memorable characteristic. However, it also fires heavy, super-dense penetrators. The ballistics aren’t the best, but these excel at piercing armour. The boltor isn’t a good choice for long-range fire, due to low projectile speed and significant bullet drop. [BODY 05, Projectile weapons: 07, Range: 04, Sharpness (Projectile weapons): 03, Ammo: 12, Recommended STR 04, Advantage : Autofire, Descriptor: Piercing, Limitation: Projectile weapons have No Range – use the listed Range instead]. A huge, heavy pump-action shotgun built by and for Tenno warriors. It is amazingly powerful, and each shot sounds like a muscular thunderbolt slamming shut a bank vault door. There is no semi-auto mode. Each shell must be chambered by a superhumanly strong person working the pump. It thus fires relatively slowly. Especially since it must also be reloaded shell by shell, and only holds five. The sound of the weapon being worked is unusually intimidating. The Corinth can also fire airburst grenades. Like the rest of the weapon these are powerful, rugged and simple. They will detonate at exactly 20 metres – not before, not after. I can imagine a mechanism that strips and ejects the buckshot from the shell, and floods the freed space with a timed explosive liquid. The powerful Corinth isn’t commonly deployed, even by the Tenno. It requires specialised training and warframe reinforcements. [BODY 05, Shotgun Blast (Range 04): 09, Sharpness (Shotgun blast): 02, Ammo: 05, Recommended STR 07, Drawback: Long Reload, Descriptor: Ballistic] w/ Airburst grenades [Mental blast (Area of Effect 1, Indirect 1): 08, Shockwave (Area of Effect 1, Indirect 1): 08, Ammo: 05, Bonus: both Powers are Combined, Drawback: Very Long Reload, Descriptor: Bludgeon]. The airburst is Indirect 1 since the point is to detonate above the targets to ignore most forms of cover. The airburst is dumb (it always detonate at 20 metres), but an experienced operator will manoeuvre to compensate. Since warframes are so mobile, it ends up being no big deal. It is common for Corinths to be modded to reduce the reload time. One of the standard Grineer firearms. Its name is presumably an onomatopoeia. It is an oversized submachinegun that spits out bullets at an alarming rate. The projectiles are light, with poor ballistics, and the fire rate produces significant recoil. But this weapon is meant for close-quarter storming actions, and to saturate Corpus shields with squash-head rounds impacts. Curiously, reloading is done by replacing the cauldron-like object at the bottom of the trigger handle. Maybe it’s some sort of liquid propellant. If so the bullets might be teleported in, since the Grineer have some crude short-range teleportation tech. A Grakata has downsides due to its specialised close-range anti-shields usage. Thus, the Grineer Lancers who wield it are normally mixed with other trooper types with different weapons. [BODY 05, Projectile weapons: 08, Range: 05, Sharpness (Projectile weapons): 02, Ammo: 10, Recommended STR 05, Advantage : Autofire, Drawback: PW has No Range, used the listed Range instead, Descriptor: Bludgeon]. 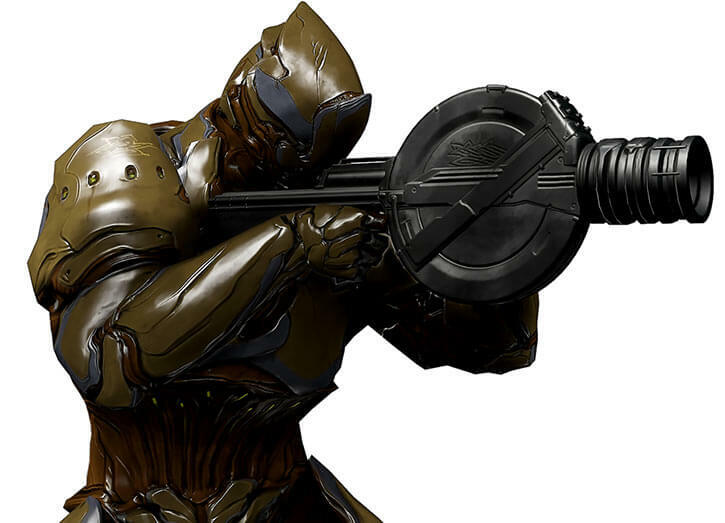 An oversized Grineer four-barelled shotgun. It is loaded with the biggest flechette rounds that can be produced cheaply and quickly. Apparently the action rotates between the barrels, firing them in turn. It weighs a lot, and the recoil requires high strength and body armour to handle. The ballistics of the Hek are surprisingly good, delivering fairly tight groups even at 15+ metres. Video game shotguns, especially in shoot-and-loot games, tend to have a wilder spread. And the flechettes hit hard enough to kill most opposition in one shot. 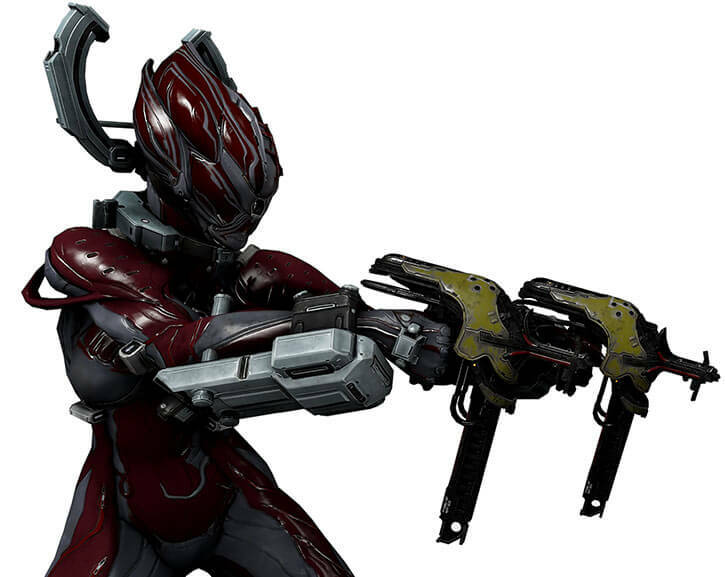 Heks are normally used by the most elite troops, such as the red-armoured Grineer palace guards. [BODY 05, Shotgun Blast (Range 04): 09, Sharpness (Shotgun blast): 02, Ammo: 04, Recommended STR 07, Drawback: Very Long Reload, Descriptor: Piercing]. If wielded by a person with an RV below 06 (vs. Unarmed damage, if using optional Descriptors), the Hek will cause self-harm. Say, 05/05 tested vs. BODY/BODY, though it cannot inflict more than 1 RAP. This is a sidenote, since it is unlikely to come up in practice. Vaykor Hek variant shotgun kindly provided by Uncle Doug. The Kohm is often considered an automatic shotgun. It has a peculiar “spooling” action. Pressing the trigger will just fire one pellet. But if the trigger is kept pressed, further shots will chain at an increasingly rapid pace, each having more and more pellets. At full spool, a Kohm puts a *lot* of metal in the air – with a magazine capacity to match. One hypothesis is that the Kohm’s core is a flywheel made of a hard but frangible material. A monomolecular wire shaves fragments off, which are redirected and accelerated to become a sort of buckshot. This hypothesis matches observed performance, and its in-game-files as a “spark gun” (think Zippo lighters). Though the projectiles have mediocre ballistics, the Kohm makes up for that through sheer volume and lengthy bursts. Single shot [BODY 04, Projectile weapons: 05, Sharpness (Projectile weapons): 02, Recommended STR 03, Descriptor: Slashing]. Ramping up [BODY 04, Shotgun Blast (Range 03): 08, Sharpness (Shotgun blast): 01, Ammo: 20, Recommended STR 04, Descriptor: Slashing]. Full spool [BODY 04, Shotgun Blast (Range 03, Are of Effect 0 APs): 09, Sharpness (Shotgun blast): 02, Ammo: 10, Recommended STR 06, Descriptor: Slashing]. This is one of the repurposed pieces of industrial equipment used by Grineer troops. Before they were turned into soldiers, the Grineer were workers. It is reminiscent of the classic Ripper weapon in Unreal Tournament. This one launches a large, circular saw blade. This “warhead” is held by four rails serving as a “barrel”. Given the impressive ballistics, one suspects some sort of magnetic acceleration, railgun -like. The spinning projectiles flies far and true, allowing for precise shooting. Where said projectiles come from is unclear. As with the Grakata, I suspect that crude teleportation is used to replenish in the field. What is in the launcher seems to only be the hub of the sawblade. As soon as it is shot, the blade apparently pop out. This results in a huge projectile, perhaps two metres wide. Reaping multiple targets in one shot isn’t rare. Furthermore, the sawblade is durable enough to ricochet off large, durable surfaces and carry on with its wayward ways. “Skill shot” ricochets are thus feasible, the trajectory being relatively predictable. 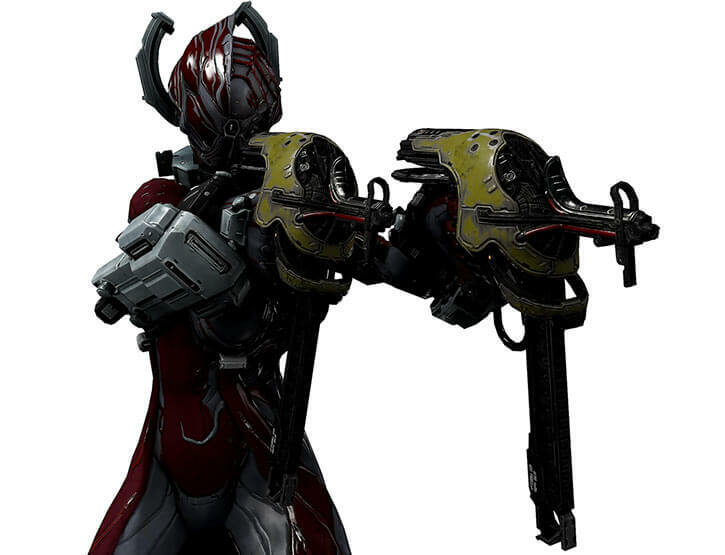 Miter launchers are usually deployed by specialised Grineer sharpshooters called Eviscerators. Tenno warframes also occasionally, but this is much rarer. Perhaps because of the need for specialised, large equipment to set up the teleportation ammo resupply. [BODY 05, Claws (Area of Effect 0 APs): 09, Range: 06, Sharpness (Claws): 02, Ammo: 20, Recommended STR 06, Drawback: Very Long Reload]. Ricochet shots tend to be Critical Strikes (hitting the same target twice), Multi-Attacks or Trick Shots (to hit a target not in direct sight or behind cover). Combat Manoeuvre penalties can be lowered or even waived in cramped quarters, where there isn’t much choice as to where the huge sawblade flies. The Area of Effect means that the projectile cannot be shot through smaller apertures, unless they are light enough for it to rip through. A straightforward, high-powered and presumably large-calibre precision rifle. It uses some sort of exotic action, but the cadence and method of use make it very much like a bolt-action sniper rifle. The Vectis doesn’t have a full-on optical scope. It features a much simpler magnification system, though it goes up to 4.5x and has a good reticle. This weapon seems more intended to eliminate power-armoured infantry at medium range, using placed shots. A well-positioned marksperson can also use a Vectis for deadly medium-range interdiction. [BODY 02, Projectile weapon: 09, Sharpness (projectile weapons): 02, Telescopic vision: 02, Ammo: 01, Limitation: Chambering a new round takes an Automatic Action]. 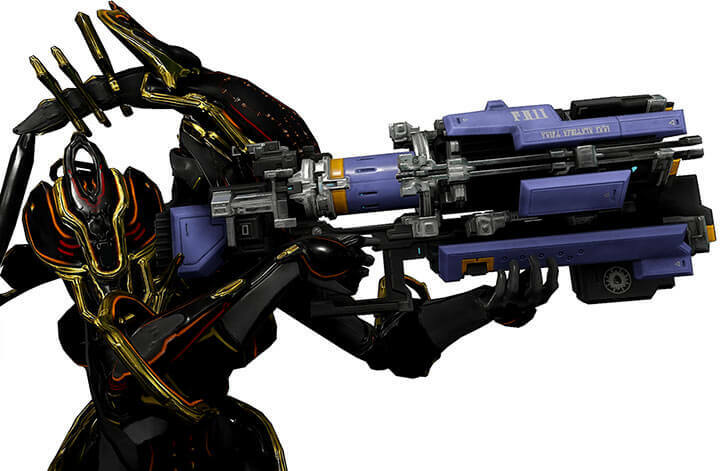 This shot shows a Vectis Prime rifle handled by a Nyx prime warframe. Both are more powerful variants of the baseline model, dating back to the Old War. 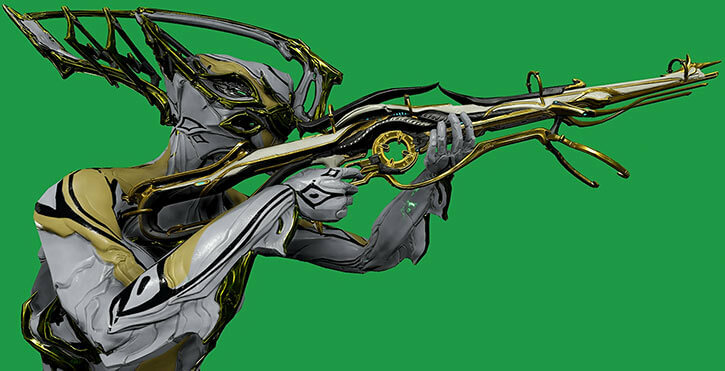 As such, both use typical Orokin aesthetics with marble white, gleaming gold, arches, gaps, etc.. This jury-rigged prototype projects a powerful heat beam. What makes it remarkable is that the flame beam, when it hits an opponent, chains to another opponent within a few meters. It can ricochet across five targets or so, though the beam gets less powerful with each hop. How it works is mysterious. Perhaps it’s a specific superheated plasma that also has conduction characteristics akin to chain lightning. The Atomos is a close-quarter weapon. But as a flamethrower of sorts it requires little precision, and it is devastating if it overcomes its targets’ defenses. [BODY 04, Flame project (Multi-attack 2): 08, Sharpness (Flame project): 01, Ammo: 10, Recommended STR 04]. A Bronco is a snub-nosed but heavy pistol. One assumes that it uses explosives to propel super-dense buckshot. The ballistics are disastrous, but the point is to use the Bronco as a close quarters defense weapon. If the target is close enough, the impact of the shot is tremendous, particularly against shields. It wouldn’t be out of place in a much larger shotgun. But past of few meters, the buckshot begins to randomly disperse and only hit the scenery. As the old joke goes, it’s a great weapon for a firefight taking place within an elevator. Furthermore, it only has two shots. I can imagine a tank full of liquid explosives for propulsion, and prepared buckshot charges looking a bit like thick coffee pads. These can be stored in the weapon, but a fresh pad has to be manually rotated into place. Broncos tend to be paired with a long range weapon such as a sniper rifle. [BODY 05, Shotgun Blast (Range 01): 08, Sharpness (Shotgun blast): 01, Ammo: 02, Recommended STR 06, Descriptor: Blunt]. A low-to-medium calibre machine pistol with a superior rate of fire. In many games this type of weapon isn’t too good. Say, the Shuriken in Mass Effect. But the Furis has excellent ballistics, allowing for tight groups of called shots. This makes it deadlier than raw numbers would indicate. [BODY 05, Projectile weapons: 07, Sharpness (Projectile weapons): 02, Ammo: 08, Recommended STR 05, Advantage : Autofire, Descriptor: Ballistic]. The gammacor is derived from ore prospecting beams. These pulverise rock and soil, and analyze the chemical composition of ores and gems as it breaks them down. Such beams are carried by individual prospectors. One of the independent Artificial Intelligences in the Origin System realised it could make for a workable weapon. And thus the gammacor was born. It indeed works as a close-range beam weapon. A gammacor isn’t a stellar gun, but its magnetism-based damage makes it good to strip force shields. And that it is a continuous beam allows for quickly ablating other types of shields, such as nullifier bubbles. Making it a sound anti-Corpus tool. Not having been designed by a Human, the gammacor looks more “alien” and sci-fi-ish than other weapons. It is also worn on the forearm, rather than wielded like a firearm, and cannot be Taken Away. [BODY 02, Energy blast: 06, Sharpness (Energy blast): 02, Ammo: 06, Recommended STR 03, Advantage: Autofire, Descriptor: Magnetic]. Gremlins seem to be repurposed, high-powered nail guns. This industrial equipment is usually wielded in pairs. Given their power, the original form of the gremlin is likely intended to be used by workers with strong, computer-guided cyber-arms (as in “limb”, not “weapon”). And they are likely meant to drive nails through dense, hard metal. Once weaponised, a gremlin is essentially a machine pistol. The velocity of the round isn’t the best, and the rate of fire is limited. But it hits fairly hard, and the nails perform well against nearly every kind of defence. All in all, these conversions can outperform the cheaper types of machine pistols. They provide fair firepower. [BODY 05, Projectile weapons: 07, Sharpness (Projectile weapons): 02, Ammo: 12, Recommended STR 05, Descriptor: Ballistic]. These are throwing knives. 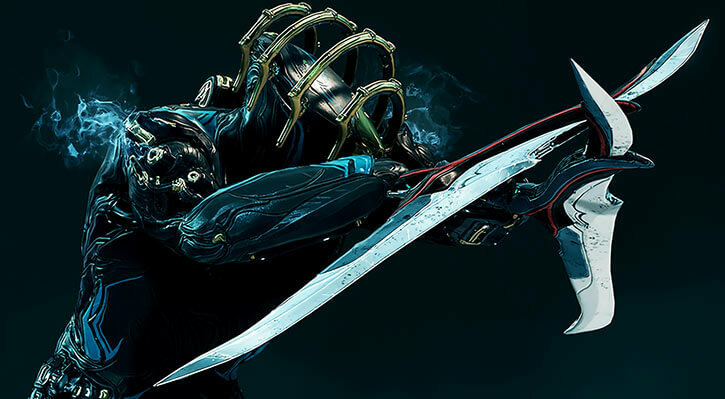 However, they are clearly adapted to warframe use – so these are super-dense, hard blades that likely weigh half a kilo. A trained warframe can throw these so quickly they’re essentially bursts. The impact can send even armoured opponents flying. Like most thrown weapons, they also don’t register on weapon use sensors. This makes them more discreet than firearms or energy weapons. [BODY 06, Projectile weapons: 07, Sharpness (Projectile weapons): 02, Ammo: 07, Recommended STR 06, Advantage: Autofire, Descriptor: Piercing]. The high angle of this shot is unusual, but it shows a Nyx warframe holding a kunai in each hand, plus one of her thigh-mounted automated kunai dispensers. An individual kunai can also presumably be wielded as a knife. The high Recommended STR does most of the lifting. 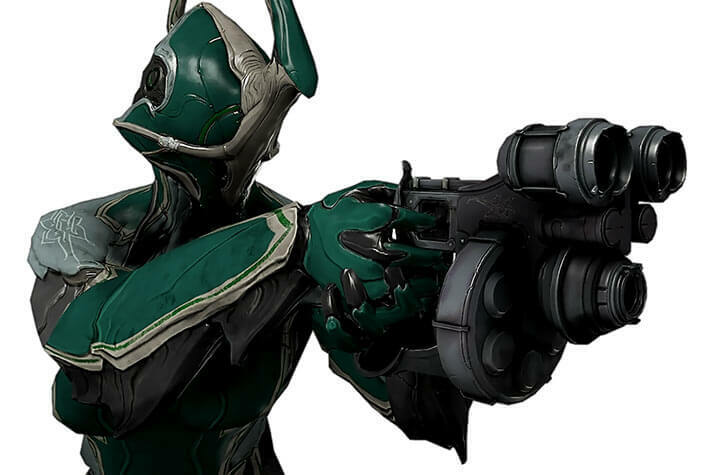 But the high EV and the Autofire Advantage are only usable for an operator who can throw at super-speed, like warframes can. The bacterial neural networks No-Prize Hypothesis in our warframes article offers an hypothesis as to how they do it. A non-super-speed thrower would likely top out at EV 4 and no Autofire. This is radically shortened lever-action Grimlok precision rifle. The stock and barrel are both sawed-off, and the lever’s frame has been enlarged to facilitate one-handed operation. With a large and super-strong operator, the Marelok is operated one-handed. It is spun around by the lever to chamber a new round, then aimed and fired. Somehow, it works. And even with the sawed-off barrel, the rifle round hits hard. 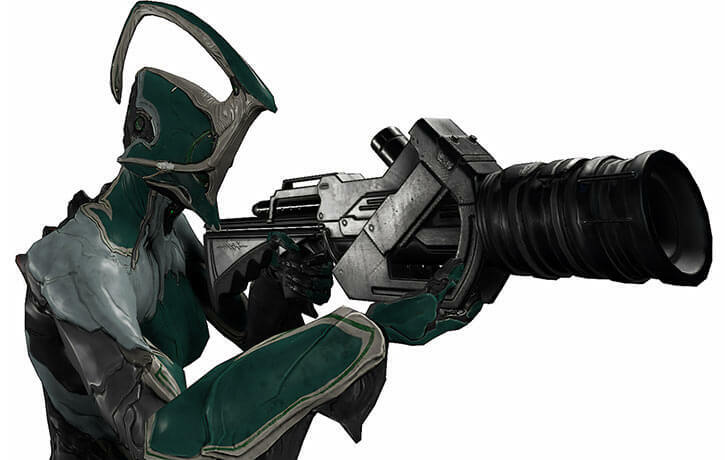 The Marelok thus provides a medium-range precision fire solution – a sort of sniper pistol. This is of particular interest to fighters with a huge short-range primary weapon, such as a shotgun or flamethrower. [BODY 04, Projectile weapon: 08, Sharpness (Projectile weapon): 02, Ammo: 06, Recommended STR 06, Descriptor: Ballistic, Limitation: a Marelok cannot perform Multi-Attacks, or Flailing Attacks]. 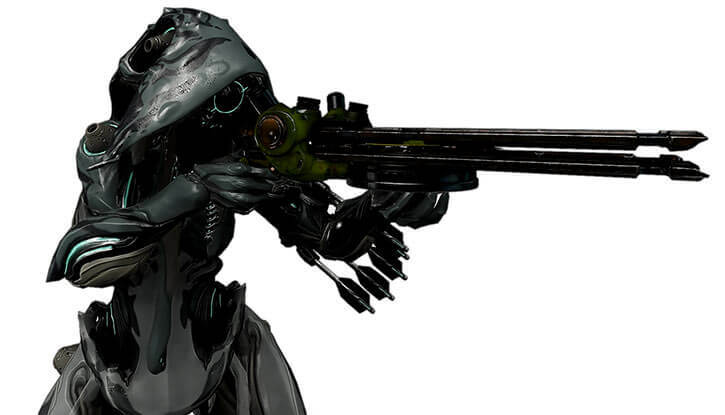 If using our optional Range rules, the Marelok is considered to have a stock (somehow). A magnum-type revolver with unusual looks. It fires faster than most video game heavy revolvers. But given the recoil, rapid fire is useless in most circumstances. By Warframe standards it isn’t particularly heavy, but it’s clearly more powerful than the baseline Lato. [BODY 04, Projectile weapon: 07, Sharpness (Projectile weapon): 01, Ammo: 06, Recommended STR 05, Descriptor: Ballistic]. Source of Character: Warframe video game. Helper(s): Some generic pictures from the Fandom wikia and from the Bandedehoufs community site . Also, Darci. Writeup first published on the 25th of March, 2019. Then updated as I play.